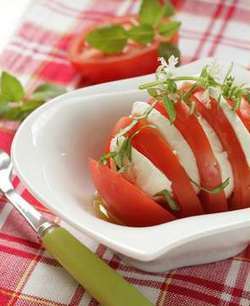 This tomato and mozzarella salad is one that you will find home cooks making over and over again in the summer months here in France. You will also frequently find it as an item on French menus. Please note that the cheese in this recipe is fresh mozzarella and not the processed, firmer mozzarella you may be familiar with. The fresh cheese is packaged in plastic sacks that allow the cheese to swim in a watery solution. Apparently the very best fresh mozzarella is made only from the milk of water buffalo in a particular location in Italy. For the purposes of this tomato and mozzarella salad, cow's milk cheese will work fine. It is one cheese you want to eat as fresh as possible. No aging for your mozzarella as it will quickly turn sour. If you detect any note of bitterness in this cheese, it is starting to go bad. Fresh mozzarella is a very bland tasting cheese, but kids especially seem to love its easy taste. It melts fabulously and lets other flavors shine through, as in this tomato and mozzarella salad. The bright summery taste of fresh basil goes well with so many foods. I keep a pot of it on the kitchen counter all summer long and cut off what I need to cook with. It just keeps growing back. One thing I love about the French grocery store is that during the summer they sell little pots of dozens of different herbs. They cost about the same price as a bunch of the picked herbs which are sold right alongside. Having pots of fresh herbs in the kitchen brightens up the cooking area and they demand little attention to keep growing. If your grocery store doesn't sell pots of herbs, I'm sure with a quick and inexpensive trip to the nursery you can outfit yourself with a summer's worth of fresh herbs. 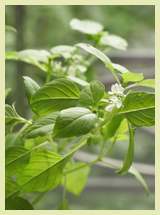 In addition to basil, try parsley, tarragon, thyme, sage, and rosemary. All of these make great additions salads. Quick note on tomatoes: You do know that you're not supposed to refrigerate tomatoes? It kills their flavor. Therefore it is probably needless to say that, for this salad, they should be at room temperature. Slice the tomatoes in 1/4 slices. Do the same with the cheese. On a serving platter, layer the tomatoes and the cheese in an attractive manner. Stack the basil leaves, roll them up and then, using a pair of scissors, cut off strips over the serving plate evenly distributing ribbons of basil. Drizzle the olive oil evenly over the salad, then sprinkle lightly with salt and pepper. Let sit for 10 minutes before serving so that the flavors have time to develop and mingle. You could also dress this salad with a vinaigrette instead of the olive oil and salt and pepper.